Get permission from a property owner to use their site as a location in a film or TV production with this template Location Permission and Release form. The property owner gives the production company permission to use the property as a film location and releases the producers from future claims for loss or damage. The production company can use the location for filming for the period of time specified in the Release. The property owner consents to letting the production company bring in the necessary equipment and personnel to complete the shooting. Never ever film on private property without getting consent. That's why you need this Location Permission and Release Form for your movie or TV production. Get this Performer Release and Consent Form signed by every actor or other performer in a film or television production. The performer releases the producers of the project from future claims. The release grants the producers the perpetual right to use the performer's image, likeness or voice recordings in connection with the film. The performer agrees to be available for reshoots if and when required. The performer waives his/her right to bring suit against the producers with respect to the production at any time in the future. A signed Release and Consent Form should be obtained from every performer before shooting starts. Hire a minor child for a film production by having the adult responsible for the child sign this Consent of Parent or Guardian form. 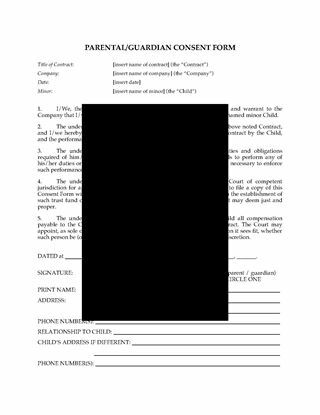 The adult consents to having the child enter into the contract. The adult also guarantees the performance of the child's obligations under the terms of the agreement. The adult releases to the child all compensation payable to the child under the contract, and the parent will have no right to any money earned by the child under the contract. The Consent of Parent or Guardian for Minor to Enter into Contract is necessary if you're signing an underage actor for a part in your production. Make sure to get it signed before filming his/her scenes. You've got a limited production budget? No problem. The Film Production Shooting Schedule form is priced so low, it fits any budget. Just buy it and download it. Prepare Cast and Crew Call Sheets for a film or television production with these template forms. shoot times and wrap times. Get a copy of the Cast and Crew Call Sheets for your second AD. Make up your contact sheets for the cast and crew of a film or TV production with these downloadable forms. The file contains two templates, one to be used for cast and one for crew members. Fill in each contact sheet with the names of everyone involved in the filming, their phone, cell and pager numbers and emails at which they can be reached. This is a reusable digital template which can be filled in on a PC or laptop, or printed off in blank form and filled in by hand. The Film Crew Contact Sheets are affordable and easy to use - get your copy now.